The Texas Supreme Court will hear arguments Thursday morning in an online defamation case that could have far-reaching effects on individual freedom to post online. The case pits Austin businessman Robert Kinney, against his former employer, Andrew Harrison Barnes. Kinney argues that Barnes defamed him when he wrote in an online post that Kinney organized a kickback and bribery scheme. Kinney is appealing lower courts’ rulings that allowed the remarks to remain online. The courts ruled that forcing removal of them would constitute a prior restraint on speech. Barnes’ attorneys argue that the rulings should be upheld and the lawsuit dismissed. If the Supreme Court reverses the lower courts' rulings, the case could give Texas courts the power to order the removal of false statements from the internet. That's the outcome Kinney and his attorney say is necessary because the internet can allow damaging information to spread so quickly. Kinney worked in California as a recruiter for the lawyer recruiting firm BCG Attorney Search until 2004, when he established his own firm in Austin. Barnes says Kinney left because he was fired. In an online post on a legal news blog and an employment search website, Kinney was accused of “orchestrating 'an unethical kickback scheme’” and bribing an associate at a law firm to hire one of his candidates, according to legal briefs in the case. Barnes is an officer of both websites. The online post prompted the Texas lawsuit in which Kinney calls the statements false and defamatory and asks the court to order them removed. A Travis County trial court initially dismissed the case, ruling that removing content from a website, even if it is false or damaging, is an “impermissible” prior restraint on speech. The 3rd Court of Appeals upheld the dismissal in 2012. 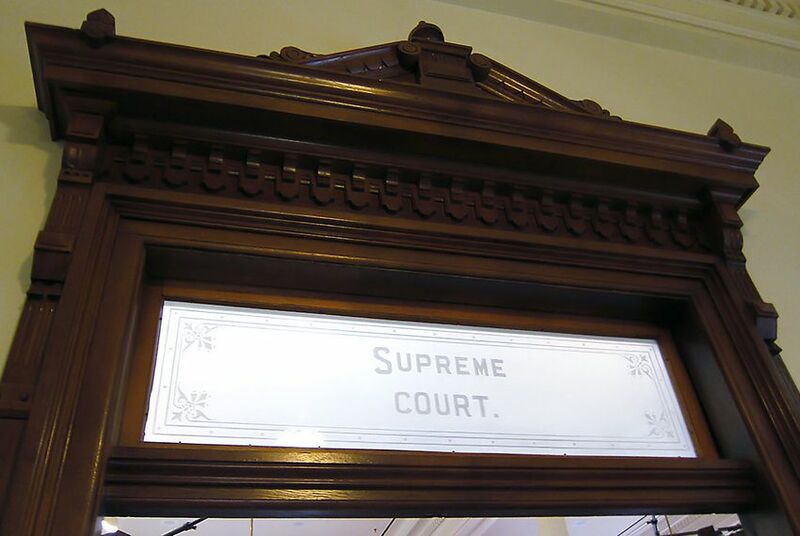 The Texas Supreme Court is set to consider whether the Texas Constitution's standards are stricter than the First Amendment and prohibit courts from forcing individuals to remove false statements posted on the internet. The court will also decide whether ordering the removal would be an unconstitutional restraint on speech, or "prior restraint." Kinney’s attorney Martin Siegel said it's not unconstitutional to restrain the statements because they are defamatory and therefore are not protected by the Constitution. “Prior restraints are typically broad orders that prevent someone from participating in certain types of speech before a court has fully adjudicated whether that speech is constitutionally protected,” Siegel wrote in an email. Barnes' attorneys, according to case briefs, said that argument was "without merit." Additionally, Kinney's lawyers argue in their briefs that his request would not be a prior restraint because he is not seeking to prohibit Barnes from posting defamatory remarks in the future, only that the existing statements be removed. Barnes' lawyers, however, argue that the 3rd Court of Appeals got it right when it ruled that ordering the removal of the statements would be an unconsitutional prior restraint, because removing them would prevent others from seeing the remarks and would stop others from posting their own statements in the future. The Texas Supreme Court has not previously considered similar cases, but Barnes’ attorneys argue that there is some precedent to the litigation. Barnes' attorney Michael Parker said Texas case law clearly indicates that “injunctive relief” is unavailable to address defamation. But Siegel argues that the case law Barnes’ attorneys cite is outdated and doesn't take into consideration the internet, which makes it easy to widely disseminate information. Kinney said he wants to push Texas laws on internet defamation “into the modern era." “I am not likely to gain a lot from this personally at this point,” Kinney wrote in an email. Editor's Note: This story has been updated to reflect Barnes' assertion that Kinney was fired from Barnes' firm.